Revenue obtained from the global fruit pomace market is projected to reach US$ 4,155.6 Mn by 2027. Valley Cottage, United States - January 15, 2019 /MarketersMedia/ — The high nutritional content requirement in processed food products has become a mainstay for consumers. Fruit pomace is a by-product from the fruit processing industry that contains essential dietary fibers and important components such as anthocyanin from the fruits which is high in nutritional value. 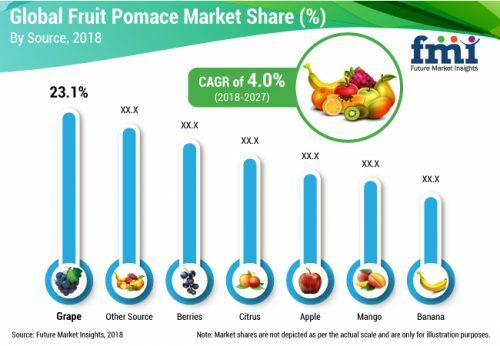 According to a new study by Future Market Insights, consumer demand for fruit pomace is anticipated to experience a meteoric rise, due to which fruit pomace has seen a significant increase in utilization in various edible products. Fruit pomace was commercially used only for animal feed and compost. All the remaining fruit pomace was being discarded. But a lot has changed in recent years as commercial applications of fruit pomace has evolved and it is expected to find its way into a plethora of processed food products over the forecast period. Fruit pomace market is expected to account for a robust CAGR of 4.0% between 2018 and 2027. The fruit pomace is available in various forms such as pellets, powder and paste also called as wet pomace. The wet pomace is dried to produce pellets and powder. Fruit pomace is the waste generated by the fruit processing industry, which contains the seeds, peels, and pulp of fruits after juice, oil, puree, and concentrate extraction. The fruit processing companies tend to discard fruit pomace, which results in an increased burden to identify methods of disposal and harm to the environment. Due to regulatory bodies taking appropriate measures for limiting pollution, the idea of using fruit pomace for various other applications has been identified, rather than disposing it as waste. This is also likely to promote environmental sustainability of the companies in the business of fruit processing by using fruit pomace in various applications, selling it to industrial users, or as animal feed to livestock farmers. Companies that are following environmental sustainability in their production facilities can benefit from using a strong marketing message. Also, the fruit pomace that tends to be discarded after processing can account for approximately 20% of the cost of the fruit itself. Better management of by-products from the fruit processing industry is likely to benefit the environment as well as key participants across the value chain. The trend of consumer expenditure on organic products has been increasing over time. North American market sales of certified organic products hit US$ 6.2 billion in 2015, up 14 percent from 2014. The organic products market, globally, has seen a rise during the early 2000s, and it is still trending. Also, the popularity of organic products in all sectors has been noticeable. Organic fruit pomace is also available in the market, which is produced from certified organic fruits that are processed. This segment is expected to experience considerable growth of 5.6% in revenue terms between 2018 and 2027. Consumers are preferring organic fruit pomace over conventional variants which has incentivized fruit pomace suppliers to capitalize on this demand. More often than not, consumers follow the health-promoting properties of a product, along with the price and taste. Health awareness and close attention to the labels by consumers in the food products that they consume have led manufacturers to enhance the nutritional content of the products that they produce. This has resulted in the introduction of fruit pomace into the food and beverage processing industry. Fruit pomace that is produced from fruit processing is a rich source of fiber, which is a very essential component of human diet. The addition of fruit pomace during the manufacturing of a food product can increase dietary fiber content and other nutritional composition such as minerals, carbohydrates, pectin, and antioxidants. The incorporation of fruit pomace into dairy products, baking flour, and food flavour is on the rise, due to the various health benefits that fruit pomace has on human health.